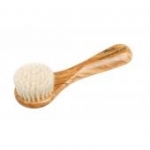 Nessentials carries a wide variety of all natural body massage brushes for dry massaging your body, to exfoliate, remove dry skin, improve circulation, immune system, energy flow, to lower acid household and reduce cellulite. Materials: wood, natural boar's bristles, bronze wire or plant fibers. Made in Germany. 100 % natural. Waxed beechwood with soft light bristles, all natural, Made in Germany. Waxed olivewood with pure ultrasoft goat's hair, 16 cm. Dry massage only. Oiled beechwood, pure all natural bristles, length 52 cm. Hand Made. oiled beechwood, all natural light soft bristles, 7 cm. Made in Germany. Oiled beech wood with very soft goat's hair bristle, 14 cm.